Leaves color green when they young are red, the leaf in obovate shape grow in roseate structure. Flower color white or pink, the flowers small with five petals on the pink flower some cultivars have stripes of pink or white, the flower grow in clusters. 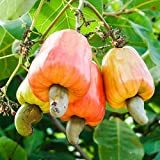 Fruit call Cashew tree apple the fruit color can be: red, green, orange or yellow, the fruit are juicy in apple or pear shape. Nut white in kidney or half-moon shape the nut is not real nut but consider and used as nut the “Nutshell” is toxic. White or pink flowers, the flowers small with five petals on the pink flower some cultivars have stripes of pink or white, the flower grow in clusters. What can be done with big quantities of Cashew tree nuts?